Maracas are an instrument associated with Latin American music. They were originally made of gourds and filled with seeds to produce a rattling sound when shaken. Handles are attached to the gourds to help control the movement of the instruments. Maracas are now made of wood or plastic, rather than the husks of dried vegetables. Maracas belong to the percussion school of instruments. Percussion instruments make sound by being struck or shaken, rather than with wind or strings. Other percussion instruments are the drums and xylophone. Within the percussion category, maracas are classified as idiophones. Idiophones are solid or sealed objects that have a full sound. Idiophones are some of the world's oldest instruments. The origin of the maracas are traced to several Latin American regions, including Colombia, Venezuela, Brazil and Paraguay. A legend in West Africa tells of the first maracas being made by a goddess who sealed white pebbles in a calabash. The rind of the calabash fruit was also an original material for maracas. In the 20th century, the popularity of Latin American music such as the tango spread the use of maracas around the world. Maracas have three parts. The bell (where the sound originates when they are shaken), the filler in the bell and the handle. Each of these components can be made of several substances. The gourd and calabash are the most common original materials for the bell. But bells of maracas have also been made with leather and today are manufactured with plastic and wood. Anything that shakes can be put inside. Beans, beads, shells and metal pellets have all been used. The handle of a maraca is made from wood or plastic. 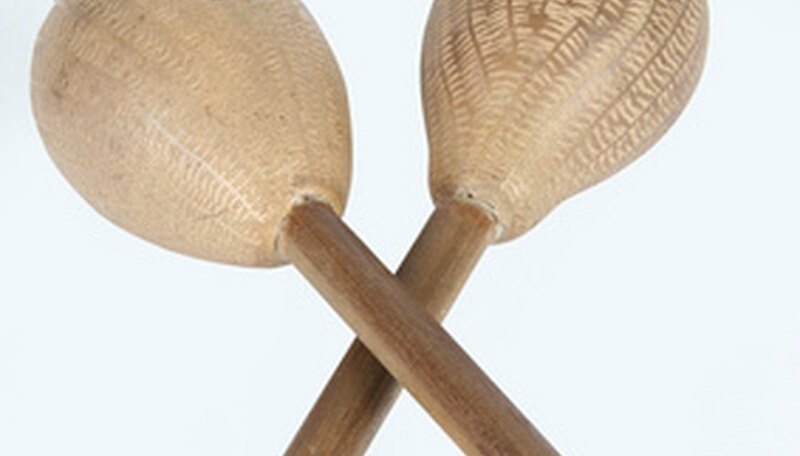 The design of the maracas has not changed much from its centuries-old origins. The shape of the bell depends on the material used. In the past, handles were whittled to fit inside the hole of the gourd. But technology has prevailed with glue that ensures a sturdier construction. Maracas are typically painted on the outside with bright colors. Green, red and orange are popular colors for maracas. Sometimes landscape scenes are painted on the outside. Maracas are common throughout Latin music from mariachi bands to traditional tribal ceremonies. But they have also made an appearance in unlikely compositions, such as Prokofiev's 1935 ballet, "Romeo and Juliet." Leonard Bernstein's 1942 work, "The Jeremiah Symphony," called for the use of maracas as drum sticks.